Back to getting my Etsy on this weekend. Well it has been raining. Constantly. Looking at one of the little details of your big day with a bunch of special wedding ring box ideas. You’ll have seen geometric glass pieces and copper tones everywhere, big news for both interiors and Weddings this year. Definitely a Wedding item you would keep and place in your home to house a relaxing candle, your jewellery, keys and other trinkets. 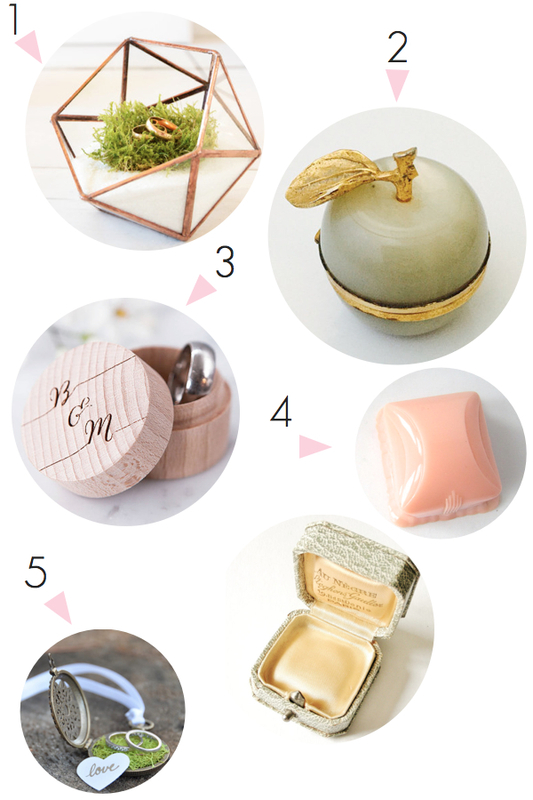 A cute trinket or pill box can be found to fit with your love story or wedding theme. Apples are super special to me (my first word and the Big Apple has been a big place for our fam) so I love this but I also stumbled across dreamy shell designs, bird nests and music boxes. Something customised will be something treasured, initials, your wedding date, song lyrics. Make it personal. Vintage lovers will dig these beautiful old ring boxes. How incredible is this authentic art deco shell pink number? My favourite from these wedding ring box ideas. And for something a little different, using a locket instead of a box to hold the wedding rings. One way to guarantee they are not lost in transit!